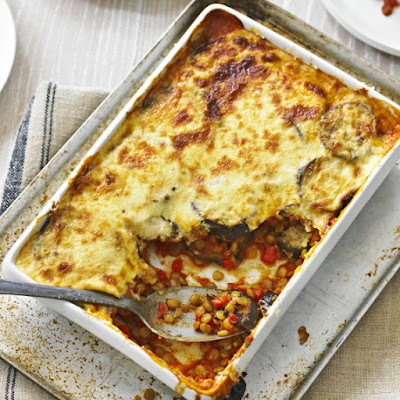 Go Bake or Go Home: Moussaka! I absolutely love this vegetable packed layered style casserole. It freezes and travels well too! - You'll need an 8x8" glass baking dish for the casserole and a couple baking sheets lined with parchment for roasting the vegetables. - Slice the potatoes, eggplant and zucchini lengthwise into 1/2" strips. - If your eggplant is large and/or old, you may need to salt and drain the sliced eggplant to remove bitterness. To do this, generously salt the slices and allow the bitter juices to drain in a colander in the sink for about 20 minutes, then rinse and pat dry. - Place the veggies on the baking sheets and brush with olive oil and sprinkle with a small amount of salt. Bake for 20 minutes or until nicely browned! - Next, fry onion and garlic until browned and add the cooked lentils and fresh herbs. Add a few tablespoons of tomato sauce and continue to cook 10 or so more minutes. Set aside. Tomato sauce, eggplant, tomato sauce, bread crumbs, potato, tomato sauce, pine nut cream, eggplant, tomato sauce, all of the lentil mixture, tomato sauce, potato, zucchini, tomato sauce... the rest of the pine nut cream! - Top with tomato slices, some whole pine nuts and Daiya cheese! - Bake for about 30 minutes, you should start to see the sauce bubbling up along the sides of the baking dish and the cheese topping will get melty! - Try to let it cool before digging in! It'll hold its shape better. That looks delicious! I'm serious. I've been gone awhile, but it's so good to see that you're posting regularly. Nice post caterers in jalandhar thanks to all.